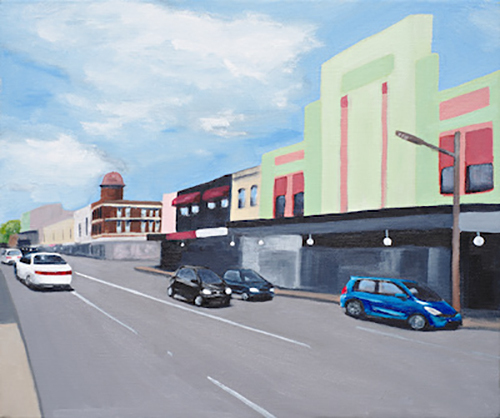 'Urban Perspectives' is a series of oil paintings which are a celebration of the ubiquity of images embedded in the urban landscape, exploring the beauty within the built environment by giving warmth and personality to concrete streetscapes. Each urban landscape is simplified by the elimination of any suggestion of the "hustle and bustle" that usually distinguishes urban life. 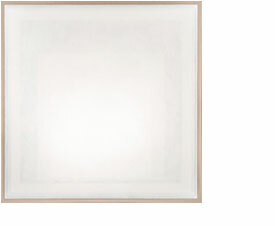 Furthermore, the simplicity is extended to the painting style where extraneous detail is replaced with attention to shapes, colour and tone. 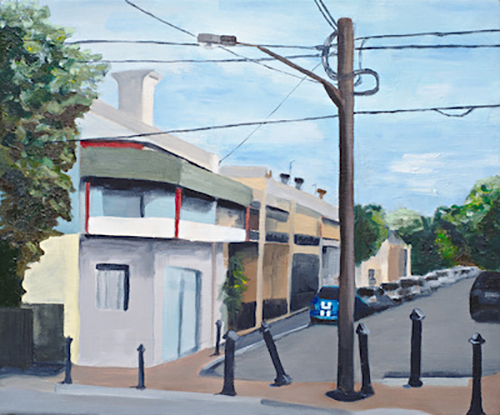 Each street scene, from usual to unexpected viewpoints, focuses on the linear perspective system allowing the buildings and streets to realistically recede into the distance, projecting the illusion of depth. 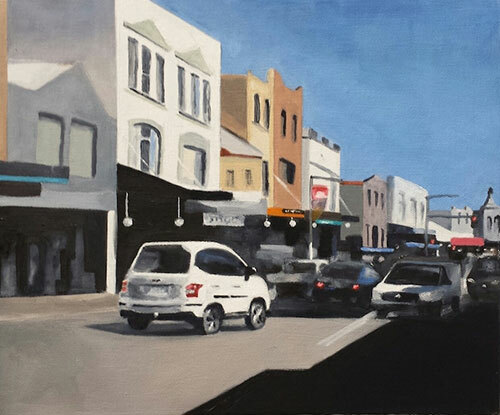 The touches of red, green and blue vibrate with more energy when surrounded by the varying greys and browns of the buildings and streets, and the contrasts of light and shadow heighten the emotive value of the scenes. 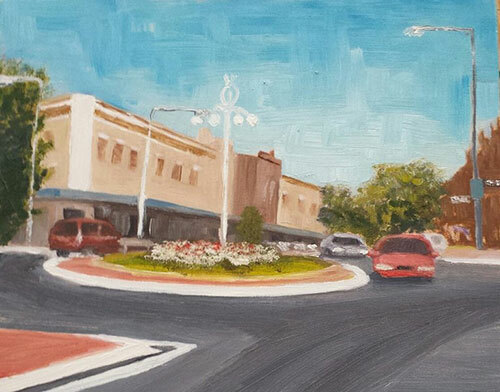 With a close focus on perspective, sharp verticals and loose paint application, these oil paintings take shape from the influences of Jeffery Smart, Richard Diebenkorn and Edward Hopper. 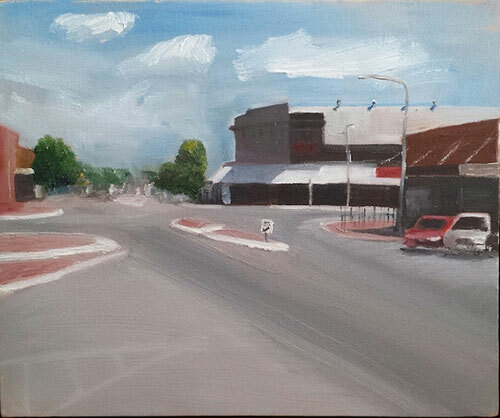 King Street I, 2015, oil on canvas, 30 x 25cm. 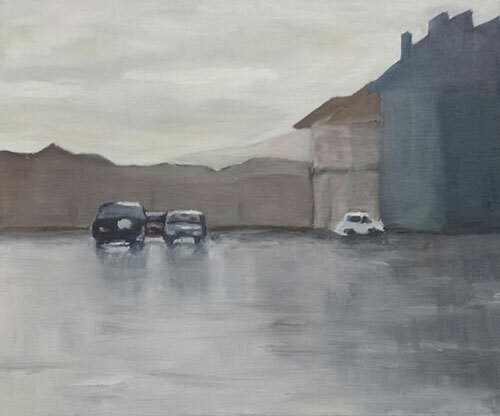 No Through Road, 2015, oil on canvas, 30 x 25cm. 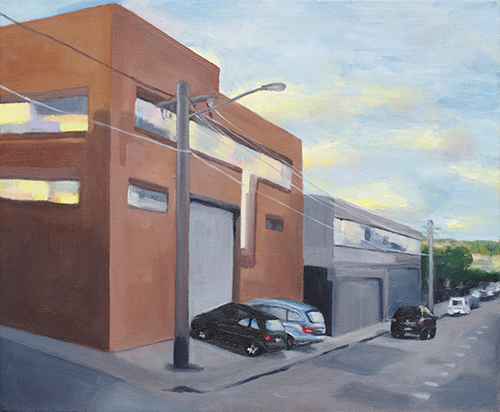 Shepherd Street at Sunset, 2015, Oil on canvas, 30 x 25 cm. 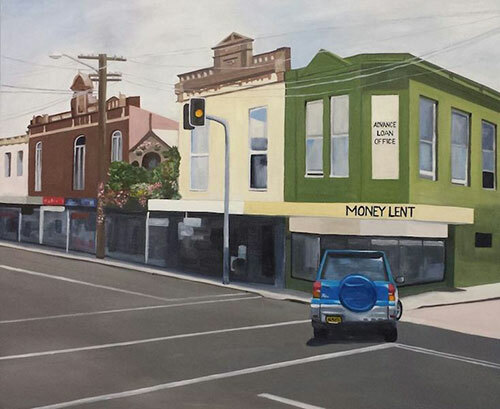 Money Lent on King, 2015, Oil of canvas, 91 x 76 cm. 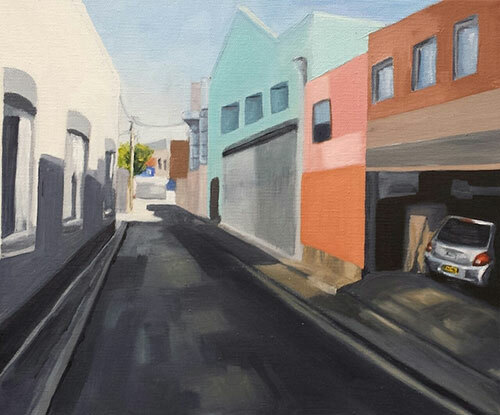 Back Lane, 2015, Oil on canvas, 30 x 25 cm. 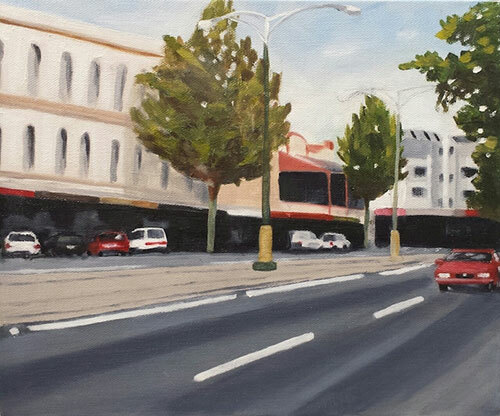 King Street, 2014, Oil on canvas, 30 x 25 cm. Don't Cross, 2014, Oil on canvas, 30 x 25 cm. 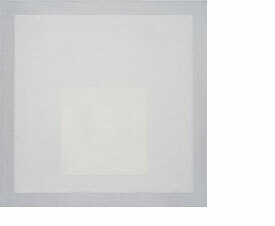 Untitled, 2014, Oil on canvas, 30 x 25 cm. 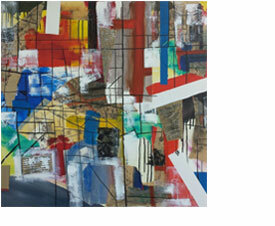 Keep Left, 2011, Oil on canvas, 30 x 25 cm. 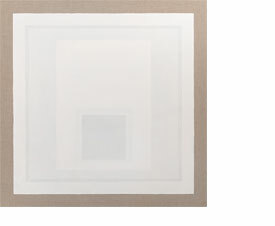 Untitled (Roundabout), 2011, Oil on canvas, 30 x 25 cm.